Discussion of FDA inspections, whether for cause or part of a routine GCP inspection, usually centers on the inspection of trial sites and the CROs who are tasked with managing them. The reason for the disproportionate focus on the inspection of trial sites and CROs stems from two material factors: the patient-centered nature of research and the abundance of trial sites and CROs, at least in comparison to the number of sponsors. This imbalanced focus on site and CRO inspections, however, stems from more than just site’s and CRO’s proximity to subjects, it is also the result of intentional risk-mitigation strategies of sponsors. The current system, based on a structure of outsourced responsibility, ensures the majority ethical risk resides with trial sites (who are in direct contact with patients) and the CROs who perform direct oversight. This, however, does not mean sponsors can dismiss inspection readiness. Even if a sponsor does not expect an inspection relating to a regulatory submission, if findings are identified at the site or CRO, inspectors will look to the sponsor’s failure identify and correct the noncompliant behavior. The regulation is clear even though, “A sponsor may transfer any or all of the sponsor’s trial-related duties and functions to a CRO… the ultimate responsibility for the quality and integrity of the trial data always resides with the sponsor.” (ICH GCP 5.2.1). Although the likelihood of inspection may be lower and the number and frequency of findings small in comparison to the clinical site and CRO, a 483 issued to a sponsor has serious implications and can produce far-reaching regulatory, financial, and reputational damage. Selection of Investigators: The foremost responsibility of the Sponsor is, “selecting qualified investigators,” and, “providing them with the information they need to conduct an investigation properly.” It may be tempting to select an expert in the field or someone who has worked closely with your organization, however, the FDA expects to see principal investigators that are experienced in clinical trial conduct, not just in a specialty. According to 21CFR312.53(a), FDA expects the Sponsor to complete efficient due diligence, selecting, “only investigators qualified by training and experience as appropriate experts to investigate the drug.” This means checking the debarment list at a minimum and encourages QC systems that track investigator training and performance. Effective Monitoring: Another key role of the Sponsor is to, ensure “proper monitoring of the investigation”. In order for a Sponsor to fulfill his or her other responsibilities, the Sponsor must continually monitor the performance of the investigator’s site. Proper monitoring begins with a monitoring plan that is established before any monitoring visits are scheduled. Once a plan is established, a system should also be devised to track and close action items that are uncovered during monitoring visits. Consider this warning letter, where the Sponsor was cited for improper monitoring based on the failure to identify ongoing issues at a site. The role of on-site monitoring cannot be dismissed or replaced with remote monitoring. Furthermore, sites that have not received a recent visit due to delays or low enrollment should be closed. Conducted to Plan: The Sponsor also has a duty to, ensure “that the investigation(s) is conducted in accordance with the general investigational plan and protocols contained in the IND.” This also includes making sure the IND that the investigation is conducted under is kept active by the sponsor. Conducting an investigation to plan means following the protocol—so protocol training must be well documented and rigorous. Inadequate training can lead to mistakes such as forgotten assessments, missing documents, and acting before receiving proper approval from an IRB. The sponsor must ensure the staff knows and separates research activities from clinical treatment. When mistakes are made, they must be documented and when challenges are identified modifications to the protocol should be preferred over any kind of exception. Consider this warning letter where an important assessment was systematically forgotten, and study staff were enrolled in direct contradiction to the protocol. Although this letter was issued to a site, such a poor inspection result on the site level would trigger inspections of the sponsor or greater scrutiny of a submission. These three explicitly named responsibilities of a sponsor, the selection and management of quality investigators, ongoing monitoring and oversight, and creation of and adherence to an investigational plan, represent only a small part of the work of a successful and compliant sponsor. These fundamental remits are the end product of a functioning quality system and extend far beyond the approval investigators, retaining of monitors, and authoring a protocol. 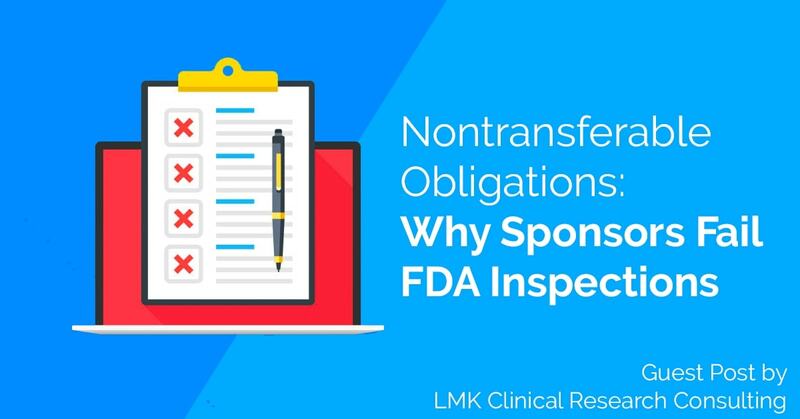 In the next guest blog from LMK, watch for the second and final post in this series on sponsor inspections, Inadequate Procedures, where we will discuss the systems which support the main oversight duties discussed in this post. We’ll examine how weak SOPs, poor timeliness, and a dysfunctional TMF can undermine even the most well-intentioned sponsor. LMK Clinical Research Consulting is a leader in document management solutions to the life sciences industry. We provide expert knowledge and experience in TMF and quality document management. We also offer custom and comprehensive solutions to meet the needs of pharmaceutical and biotechnology companies and clinical trial sites.